Workman Publishing Company, 9780761193098, 256pp. Imagine finding a glimmer of good news in a diagnosis of Alzheimer’s. And imagine how that would change the outlook of the 5 million Americans who suffer from Alzheimer’s disease and other dementias, not to mention their families, loved ones, and caretakers. A neurologist who’s been specializing in dementia and memory loss for more than 20 years, Dr. Gayatri Devi rewrites the story of Alzheimer’s by defining it as a spectrum disorder—like autism, Alzheimer’s is a disease that affects different people differently. She encourages people who are worried about memory impairment to seek a diagnosis, because early treatment will enable doctors and caregivers to manage the disease more effectively through drugs and other therapies. 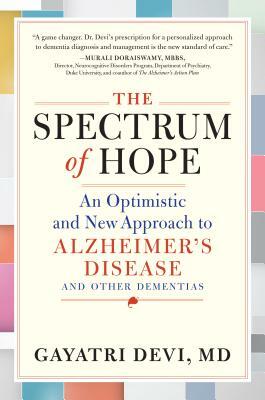 Told through the stories of Dr. Devi’s patients, The Spectrum of Hope is the kind of narrative medical writing that grips the reader, humanizes the science, and offers equal parts practical advice and wisdom with skillful ease. But beyond the pleasures of great reading, it’s a book that offers real hope. Here are chapters on how to maintain independence and dignity; how to fight depression, anxiety, and apathy; how to communicate effectively with a person suffering from dementia. Plus chapters on sexuality, genetics, going public with the diagnosis, even putting together a bucket list—because through her practice, Dr. Devi knows that the majority of Alzheimer’s patients continue to live and work in their communities. They babysit their grandkids, drive to the store (or own the store), serve their clients, or otherwise live fulfilling lives. That’s news that 5 million people are waiting to hear. Gayatri Devi, MD, MS, FACP, FAAN, is an attending physician at Lenox Hill Hospital/Northwell Health and a Clinical Professor of Neurology at Downstate Medical Center. She is a board certified neurologist, with additional board certifications in Pain Medicine, Psychiatry, and Behavioral Neurology, and she served on the faculty of New York University’s School of Medicine as Clinical Associate Professor of Neurology and Psychiatry until 2015. She is the author of over 50 publications in peer-reviewed journals on the topic of memory loss, as well as the books Estrogen, Memory and Menopause (Alphasigma Press, 2000), What Your Doctor May Not Tell You About Alzheimer's Disease (Time Warner Books, 2004), and A Calm Brain (Dutton, 2012). She lives and practices in New York City.